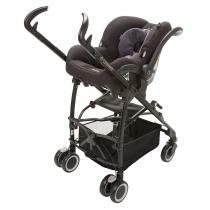 Make a smart start with the Kaia Mico Nxt Travel System. An easy, from-birth solution with the use of the Mico Nxt infant car seat. 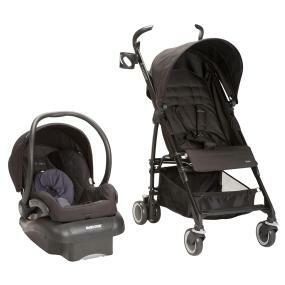 Travel system includes the Kaia stroller and the Mico Nxt infant car seat – the lightest premium infant seat available. The Kaia stroller is extremely easy to fold and unfold, is lightweight, has a robust and durable frame, reclines, and includes a parent cup holder. Stroller accomodates child up to 50 lbs. Walk, see, touch and do! Get your child’s daily discovery trip started with the Maxi-Cosi Kaia stroller! The all new Kaia is a convenient stroller that experienced parents would recommend. 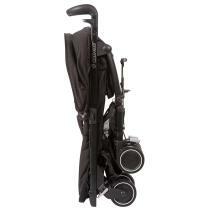 It is quick and easy to fold – and even folds into a compact stroller that stands upright for easy storage. The Kaia has multiple recline settings so your baby will always be comfortable. Please be aware that our product warranty only applies when purchased from an authorized Maxi-Cosi retailer. You may find a list of authorized retailers on the Maxi-Cosi website. The origin of products not purchased through an authorized retailer is unknown and could be counterfeit – opened box – used – damaged etc. We cannot support products which have an unknown origin as we cannot verify the handling or condition of such merchandise. Fulfillment by Amazon or any third party does not guaranty you are purchasing from an authorized retailer. We maintain a strong network of authorized retailers to ensure you are purchasing safe and complete products. Pricing which is inconsistent with the majority of retailers is a strong indication that the retailer is not authorized as we have a consistent price offering across all authorized retailers. If you are unsure of the authorization status of a retailer you are considering purchase from – you can check our website or call our customer service department.